First, as the Thai’s say “jai yen yen”, relax. Stay calm and set a simple goal to get out in one. Then, square your stance and turn your clubface inwards at address, shift your weight forward, and play the ball in the back of your stance. Turning the clubface inwards lets you use the clubface’s leading edge like a shovel to slice through the sand. Shifting your weight forward and playing the ball back encourages you to hit down on the ball. Also, choke down on the club, grip the club firmly, and keep your wrists solid throughout the swing. 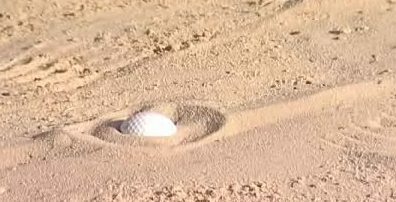 You’ll meet a lot of resistance when your club hits the sand, so you’ll need to keep your wrist solid. Take your normal backswing. Then make a smooth transition to your downswing. Come down hard into the ball; almost as if you were shoveling sand. Aim to enter the sand just beyond the lie’s outer circle. Be sure to accelerate through impact. A helpful hint is to imagine burying the club like a shovel in the sand and leaving it there. The ball comes out low with little backspin. It runs when it lands. Hitting a fried egg in Thailand isn’t as hard as you might think. Make these adjustments and you will never have to fear fried eggs when golfing in Thailand.